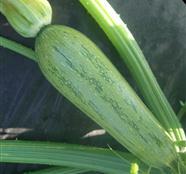 Caserta type hybrid summer squash. Vigorous uprightand open bush plant. slightly bulbous fruits, with dark green stripes on lighter green skin. With its high tolerance viral and fungal diseases, Atos F1 maintains high yield throughout harvest.